How I miss thee, once mighty 16″, when you roamed the sports car savannah unchallenged, peerless as the wheel diameter of choice for any respectable performance car. Then, one day, the 3000GT VR-4 and the JZA80 Supra Turbo arrived on the scene, with their exotic new 17″ wheels. Suddenly, the floodgates were open, and wheel diameters have been increasing at a rapid pace ever since. 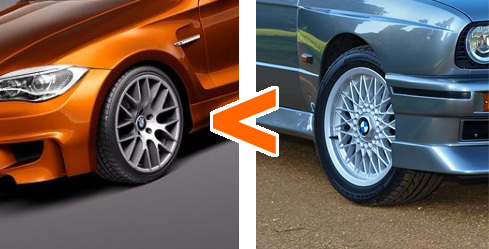 These days, 19″ wheels are virtually de rigeur if a manufacturer wants a sports car to be taken seriously. The price. Tire prices seem to go up exponentially for each inch increase in diameter, and the difference in price between a set of 18″ tires versus, some quality 15″ pieces is outrageous. Don’t doubt me; check Tire Rack for confirmation. The look. This is more arguable, but larger wheels make cars look smaller and more toy-like. Combine the wheel size with the lack of surface artifacts currently in vogue, and you have a crop of new cars that ends up looking distressingly like Hot Wheels™. And while that may be appreciated by some, I like my cars to look a bit more, well, adult, thankyouverymuch. Suspension life. Taller sidewalls absorb road imperfections much more readily than shorter ones. With every increase in wheel size, for a given road, we’re asking more of our suspension bushings, shocks and body structure. Granted, the advances in CAD-optimized body stiffness and suspension component material somewhat mitigate this downside, but why not have the best of both worlds? Control arm bushings that could last 150K miles or more? With taller sidewalls, it’s definitely within the realm of possibility. Maybe I’m just a cheapskate. Or maybe I’m just an old fogie trapped in the ’80s, when cars were made with wheel arches proportioned to accommodate smaller wheels, and that look profoundly silly when some enterprising teenager decides to slap on a set of wagon wheel 19s (with the wrong offset as well, natch). Perhaps. But come what may, I’ll always be a fan of cars that just look right with a set of good-looking basketweave 15s or 16s. Maybe 17s. But not an inch bigger. A worthy topic and one of my own favorite issue to discuss. Personally, I am a fan of the 17″ wheel on a sports car. It is the perfect balance of performance, price, and appearance, in my opinion. Sadly, the new Camaro was designed with a 19″ wheel in mind (incredibly large wheel arches) and will not look right without it. A 17″ wheel on that car looks a bit backward, which is sad because one day I would like to own one, but would rather not pay to replace a 19″ tire. I personally believe that they designed this car from the ground up with aspiration of getting a starring role in the “Transformer” movie series, as it is the perfect Clark Kent alter ego for such a thing…but perhaps without the glasses and with a steroid habit. It’s just a bit cartoonish, which isn’t all bad as long as you can accept and live with it. And it certainly has muscle enough to pull off most any outrageous look, but I would wish for a bit more refinement. I don’t think ‘refined’ is an adjective you can use for any vehicle that sports anything larger than 17″ wheels. I have seen some cars wearing 18″ wheels, and while it can look sporty, I believe it is mostly an exercise in form over function and, as such, is a turn off. Makes the car look like it’s trying too hard. A sports car should be capable first and foremost, with an over-arching design that quietly conveys it’s function…not screams it or tries to convince you with extreme accessories. For rule of thumb, I think one can categorize what era of car looks best with a certain size wheel by corresponding a size with a decade. For instance, I believe that an ’80s era car usually looks best with 15″ wheels, a ’90s car with 16″ wheels, and the latest decade car with 17″ wheels. Now there are exceptions to the rule, but this is one that I like to follow. I’m not sure if you would agree, but there it is. Totally agree about the Camaro, and that dovetails with my point about larger wheels making the cars look more toy-like. Unfortunately, if you’re looking for refinement in a muscle car, I’d have to say the Mustang GT has it all over the Camaro, based on every report I’ve seen. The GM car may have the raw numbers, but there just seems to have been much more attention to detail given to the Ford, in other words, refinement. Gotta give credit where it’s due, y’know? A lot of it probably has to do with the fact that it’s the second iteration of the Mustang’s current platform. Hopefully the next Camaro will smooth out some of the rough edges without losing any potency. I like your rule of thumb. Those were definitely the preferred wheel sizes for the smaller sports cars of each era. It’s just a shame that, as you pointed out, you “can’t go back again,” so to speak, with the proportions of most wheel arches nowadays. We’re kind of stuck. It’s a game-changer for Ford. Best-looking car they’ve come out with in years. A lot less bathtub-ish than the previous iteration, and the details are right on the money—the sequential taillights are awesome, just to cite one example. I think I’m remembering early ’00s comparos between the F-body Z28 and the Cobra, where the Ford actually did have a few ponies on the Camaro. But as you say, the SS would be more directly comparable to the Cobra. It’s always been tough for the Camaro, since it’s always had a glass ceiling in the sense that it couldn’t be more powerful or quicker than the Corvette, so as not to upstage it, and the Mustang has never had such restrictions. And yet the Camaro would always come out ahead, numbers-wise. It was mystifying, but I’ll tell you one thing: It definitely solidified my respect for what GM was capable of with their small block.